It started when I was at the Cook Dollar Barn just looking over their merchandise and I saw this squiggy for your pony tail that was a 4 inch length of hair. I knew then I could make something of that in a birdhouse. So I’m standing in my woodshop looking at this hair piece wondering where to go from here. So my thought process went: hair – hairdresser – salon. Then it all started coming. I could use the hair on the roof and set up the front like a shop. So made a standard size house, but needed a perfect color. Nothing too pink. Dusty plum – yeah. Then found a couple pink chairs from a toy castle set I had gotten. And some scissors, comb and brush from another little girls toy set. I look at what I have and it needs more. A mirror. Had to dig through many drawers before I found just the right one. It needed some color. Flowers-a beautiful pot of flowers. Tried several until I found one that looked just right. Got the hair on the roof-that turned out nice. But still needed a little more. Remembered some makeup brushes I had purchased and figured this was more important and I could get another set. So I took the big cheek brush and put on top so it lined the crease and used a small lip one for the perch. I liked that. One more thing – it needed a sign. 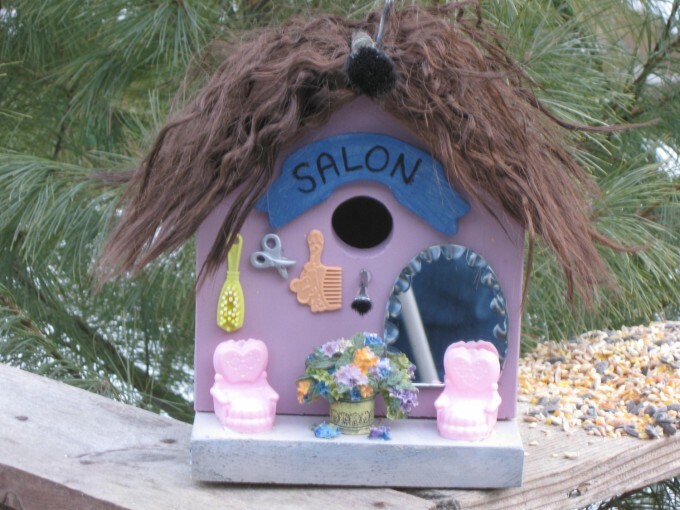 Cut one out on the scroll saw and painted it and printed “SALON” on it. There- I knew it was done. Well, pretty much that’s how it goes. And my favorite one? The one I’m working on at the time. It’s excitement when the idea starts up and then a sigh of “finished” at the end. I love each one. HI!! Yay! So excited that you are blogging now! Great to see you today; lunch was great, as usual. © 2019 - Holed Up North - Kathy Weiand.